Name, age, hometown: Eric Shriver, 21, Rancho Cucamonga, Calif. What corps are you in and what is your role this summer? Bluecoats snare drummer, section leader. Where I go to school and what I'm studying: I go to California Polytechnic University (Cal Poly) Pomona. I'm currently a music business major. Give us your full drum corps/marching music background. Pacific Crest snare line 2002-2003. 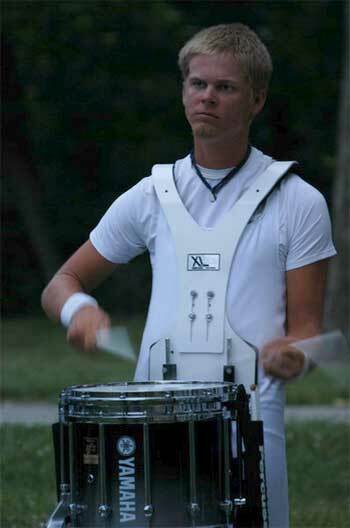 Bluecoats snare line 2004-2006 (I ageout this summer). I marched indoor with Black Knights 2003-2004, and Pulse Percussion 2005 (and 2006). Also, I was in RCC's marching band program in 2002. What's your practice schedule like? I'm typically extremely busy, either going to school full-time, teaching percussion at four different schools along with private lessons, and marching indoor/summer etc. My personal practice time definitely varies day by day, but I like to get an average of one hour a day at the least. Some days I will get up to four hours of individual time, while others maybe be five minutes. It's less about the quantity of practice time, and more about the quality. What does your ideal free day consist of This REALLY depends on the location of the free day. However, someplace where walking is limited with tons of food places to choose from (TGI Fridays in Chicago) are always popular with me. I like my free days very chill. Favorite pig-out food: Chips and a good bowl of salsa. The last great film I saw: "Memento." Such an awesome film. Jobs I have/have had: I worked at Blockbuster Video for three months, hated it. While getting through college, I have paid the bills through teaching percussion, and private lessons. Why not get paid for something you love to do? My favorite TV show: "Family Guy." This also happens to be a great series to watch on bus rides. What has been your formative drum corps moment? First time marching finals in 2004. What would you be doing next summer if you were not marching? Probably going to school, to finish up my degree sooner (it can wait, however). I'd also probably hit up every Southern California DCI show being the "superfan." How did you decide to be a member of your corps? I first auditioned for the 2004 season. I had always wanted to audition for a group where not a single person there knew who I was, where there are no expectations or preconceived notions prior to auditioning. I had no expectations of making the ensemble before I auditioned, just wanted to check it out. I had heard there was a huge percussion staff change, and did a little background research on the new staff members. I wanted to go to a corps where I could learn as much as possible. I sent in a video at first, and then got asked to come to the camp. I loved it, and the rest is history. What first attracted you to the drum corps activity? After my 8th grade year, my high school band director took the leaders of the band to a local DCI show. My older sister was a leader, so she brought me along, knowing I was going to be playing bass drum my freshmen year. I went to the DCI show in Riverside, Calif. (The RCC show). Getting out of the car, I saw both Blue Devils and SCV warming up in the lot. I instantly fell in love with the activity. From that day on, I knew I would end up marching DCI at some point. What advice would you give to young people who want to march? Keep trying. Always have a positive attitude. If you get cut somewhere, try somewhere else. Sooner or later you'll find a home. What I want to be when I "grow up": Wealthy, without having to work much (the American Dream, right?). But seriously, I would love to be involved in some way in the percussion activity. Whether it's on the educational side, or with the sales side, I am not sure yet. Favorite drum corps personality and why: Ralph Hardimon and Tom Float (tie). It seems nearly every person I have been taught by has either been influenced (directly or indirectly) by Ralph and Tom. When it comes to impact on the marching percussion activity, these two seem to always have some influence. Best drum corps show ever and why: Star '93. Love it or hate it, I'd say it has pushed the envelope more than any other corps for its time. The year is 2030. What does a DCI show look like? Rockets, fireworks and lots of back flips. Feel free to add anything else you'd like. Last summer, then done. Should be sweet.